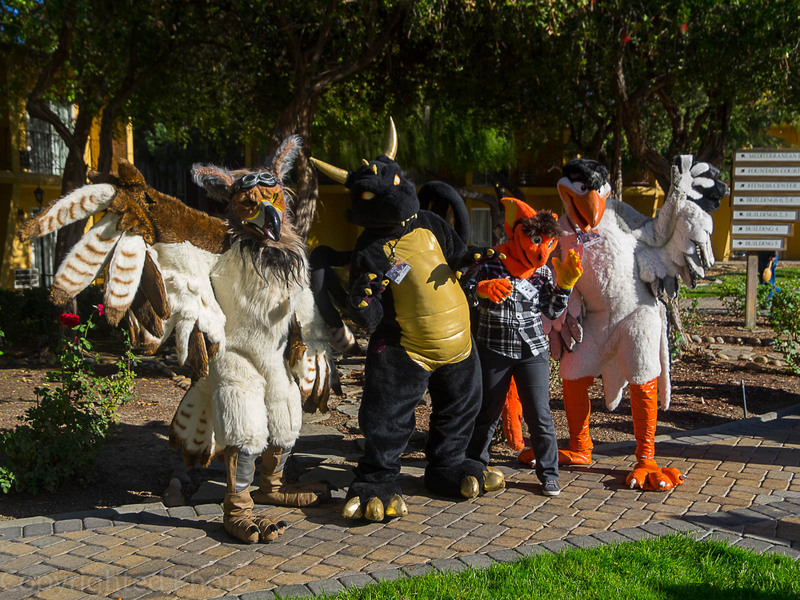 On November 15-16, 2014, Pacific Anthropomorphics Weekend brought a second Furry convention to the San Francisco Bay Area. PAW’s official attendance was 213. It was the result of much hard work behind the scenes. If only con organizing was always as serene as the palm trees on the website. I’m sorry not to post pure sunshine here: I think it’s an OK time for honesty, shortly after the con. Next year offers a clean slate. A faction of former Fur Con supporters and friends acted to start a new convention. It would compete to take Fur Con’s place. Watchers knocked the “revenge con” plan, noting that a negative reason was a weak draw, diminishing positive reasons to persist. It was ultimately resolved by abandoning a conflicting date, to simply offer a welcome new option at a harmless time. The vibe of PAW seemed geared for low-effort relaxing with friends. In a casual visit on Saturday night, I checked out three room parties with the usual suspects, and appreciated their generosity. It’s not easy to start a con anywhere, let alone near the USA’s most expensive costs of living. Difficulty is inevitable. The organizers weathered it, and delivered a con as promised. Criticism came early, but tapered off. Despite mixed feedback, the final outcome seemed to be praise from people with low expectations who were happy enough, and wanting more. It’s an OK start to come back stronger next year. One of the sights at PAW. See more photos from Ultra-Gor or Amenophis. “The first impression was zero signage and getting lost… 5 or so fursuiters, and a very, very shabby hotel… Apparently there were room-parties, but no directions to them… The organisers hadn’t properly liaised/block-booked rooms and therefore the parties had upset other residents. With literally no-one to talk to or hang with (the fursuiters just went dancing) we all left… Not well planned or executed. “Our goal was to provide a furry experience that could bridge the gap between a full-on furry convention (like Further Confusion) and a one-night furry dance party (like Frolic) … kind of a weekend-long furry chill party to socialise with your friends, hang out, play games, fursuit, enjoy a drink or two, and still have a chance to shake your tail to some good music. My opinions: Alternatives create competition. Positive competition raises quality for all. It probably does need to grow somewhat to be economical, and compete to draw at least some goers from outside the area. It brings a challenge to offer features and personality others don’t have. A chill party may not be an interesting enough draw, unless maybe it happens at a resort with nature attractions. Find features that set yours apart.